You are now entering the kindom of Freestyle Snowboarding Tricks. Ahhhhh, I love it here. To begin this section of the site, I want to share with you the importance of the sequence involved in any freestyle snowboarding tricks. The PSIA/AASI have nailed down a simple format to explain the sequence of trick execution. A -Approach- Refers the line or path taken towards the feature, which sets up the wind-up, loaded position and body position over the correct edge to release into the trick from. T -Take-Off- The moment of release. Unwinding in to a spin, pushing the hips into a flip, popping or snapping off the tail into a high ollie or, in the effort not to go high, sucking the feet in towards the body to absorb the takeoff (like in boardercross), all happen in the moment of takeoff. Timing and Finesse, Arms and Upperbody Snap to initiate rotation, Pop to gain amplitude and a subtle yet powerful burst of energy to set the trick into motion. M -Maneuver- The heart of the trick. If the approach and take-off went well, the maneuver can be quite fun. Weightless and Flowing. The key to stomping snowboarding tricks is relaxation of mind and execution of body control. By this I mean that from the moment of release the rider must be strong and active in the core of their body to control the motion and be prepared to finish the motion. Utilizing core body strength to bring the feet and lower body along for the ride, aggressively moving into the grab or no-grab postition intended. Either sucking feet up to grab the board or to rotate the board into postition under the body to land on a rail or other feature that will be part of the motion and maneuver set into action. While actively executing with the body, the mind must be focused and relaxed. Panic and freak out will result in a rough landing. So execute with the body and stay cool in the mind. L -Landing- Completion of snowboarding tricks. The rider must maintain execution and focus through the landing. To ride through any roughness or chop in the landing many times the rider must stay in the athletic zone and focus of the trick after touchdown and away from the feature. As a rider gains skill they will be able to make the landing smoother and smoother until they move into "Making snowboarding tricks look easy". That is the ultimate goal. 90 degrees or 1/4 spin from takeoff, Frontside of body and toes are facing downhill. -Regular spins Left, Goofy spins right. 90 degrees or 1/4 spin from takeoff, Backside of body and heels are facing downhill. ready to snap the unwind into the spin. For example, on a common 30-40 foot park jump, for a 360 a rider will start to unwind anywhere from 10-15 feet back from the lip of the jump. While to do a 540 it is more like 5-10 feet, or to do a 720 it's more like 4-8 feet and so on. Then of course it takes more snap, commitment to the rotation and awareness of where you are in the air and where you will spot your landing. -A common problem is starting to unwind in the same place as for the smaller spin, and just trying to snap faster. This will not work, because when the snap is finished and the rider should be releasing from the take-off, the board is still on the ground with a few feet left to the lip. This can create 2 different problems. The board may hang up on the last little bit of take-off, causing your rotation to stall out and lose energy as you take-off, leading to a crazy gyration, just to get your feet back under you. Or, the board will loose its carve and start sliding with the rotation as the rider leaves the jump. Which can allow for a lot of spin, but takes away from pop, speed, and control of the spin, which in turn makes clearing the jump and landing more challenging. The Key is Timing!! Patience and timing. These things are learned from practice and a relaxed mind set that allows the rider to focus on the moment. Taking a good approach line, winding up enough and at the right moment, then being patient and unwinding with snap and finesse to start snowboarding tricks off right. Let's go over the rotation and axis terms I will use to describe the tricks and how to do them. It is really important that you understand the basics on this page and the difference between the X Y and Z Rotational Axis. It will help to clarify in your mind how each trick works. Controlling the axis of a spin is all connected to body movement at takeoff. Think of the upper body as an inverted triangle. The shoulders being 2 of the three corners, and the 3rd corner being right between your hips. the side of the triangle between your shoulders must maintain its upright and flat positioning with the hips underneath. Keeping the shoulders parrallel to the horizon as the unwinding motion starts the rotation. Blending Spin and Flip through X Y and Z Rotations Utilizing the Grey Area between spin and flip. Corked tricks include Off Axis Rotations like Rodeos, Mistys, Cripplers and McTwists. To flip or cork, the triangle will shift depending on the flip or cork intended. For a frontflip, the shoulders come forward at take-off. For a backflip the rider will give a powerful forward push of the hips, pulling the shoulders bacg at take-off. For corks like mistys and rodeos the shoulders/hips "the triangle" will tilt at take-off and roll through the trick. Although a cork 3 is possible (very difficult), this rolling motion naturally takes 540 degrees to get your feet back underneath you to land. Misty- The lead shoulder dips and reaches towards the toe of the rear foot, as the shoulders come forward toward the toe edge to set a backside spinning frontflip. Frontside Rodeo- The Lead shoulder dips towards the heel of the rear foot, as the hips are pushed forward to set the frontside spinning backflip. Backside Rodeo- The trailing shoulder will dip toward the heel of the front foot, as the hips are pushed forward to set the backflip through the backside rotation. In all of these snowboarding tricks, the axis is more or less set in the motion at take off. From there it is crucial that the rider uses their core strength to bring the lower body with the trick. Bringing the board up into a grabed or tweaked postition adds lots of control to commit to the motion of the trick and see it through to the landing. 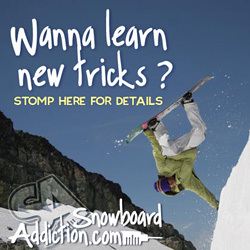 In each of the links below you will find the names and desriptions of any Freestyle Snowboarding Tricks you're anxious to learn. Take your time reading and come back often to remind yourself what your working on or want to learn next.